An elegant example of Manueline architecture & design, discover why the Mosteiro dos Jerónimos has been a source of national pride for over 500 years. The Hieronymites—a religious order dedicated to scholarly St. Jerome—quickly grew after forming in 1373. King Manuel I received Papal permission to establish a Jerónimos monastery in Belém… at the same time as he organized an expedition to discover the ocean route to India. Fate or faith? The successful voyage of Vasco da Gama, divinely linked to the monastery, inspired the king to give its monks 5% of all taxes on the spice trade. This beautiful monastery was the result. Manuel I unfortunately did not live to see its completion; however, he requested to be buried at the church’s main altar. His son & heir, João III, fulfilled his father’s wishes & converted the church into a royal pantheon. In turn João III’s son, a Cardinal-King, would also be buried there in addition to his grandson Sebastião—killed in a crusade against Muslims in Morocco without leaving a successor! The end of a royal dynasty plus centuries of political turmoil left the monastery neglected, but fortunately it survived the 1755 earthquake with little damage. However the worst was yet to come… Napoleon invaded & defending British troops used the monastery as a military hospital, causing serious damage. Soon after, liberalism in Portugal expropriated the monks & the monastery’s fate hung by a thread. Improvements—better termed “demolition”—occurred but some parts were left untouched. For almost a century a mega-orphanage occupied the monastery, & many works of art were lost, stolen or destroyed. In time, politicians remembered the historical significance of the mosteiro. Painstaking restoration, completed in 2002, made the cloister shine like new. Currently the church is undergoing restoration in phases with the end date scheduled for 2022. Detailed maps of the entire complex both past & present, a family tree of Manuel I’s descendants with easy-to-follow explanations, a map of how Portugal discovered the spice trade routes & cut out the middleman, plus original artwork & research. Through 19 points of interest, this guided walk discusses history in detail, the unique architecture of the monastery, how it changed over the centuries, & provides biographies of all the important figures buried inside: explorer Vasco da Gama, poet laureate Luís de Camões, historian Alexandre Herculano & poet Fernando Pessoa. Curious about how Endless Mile guides are written? 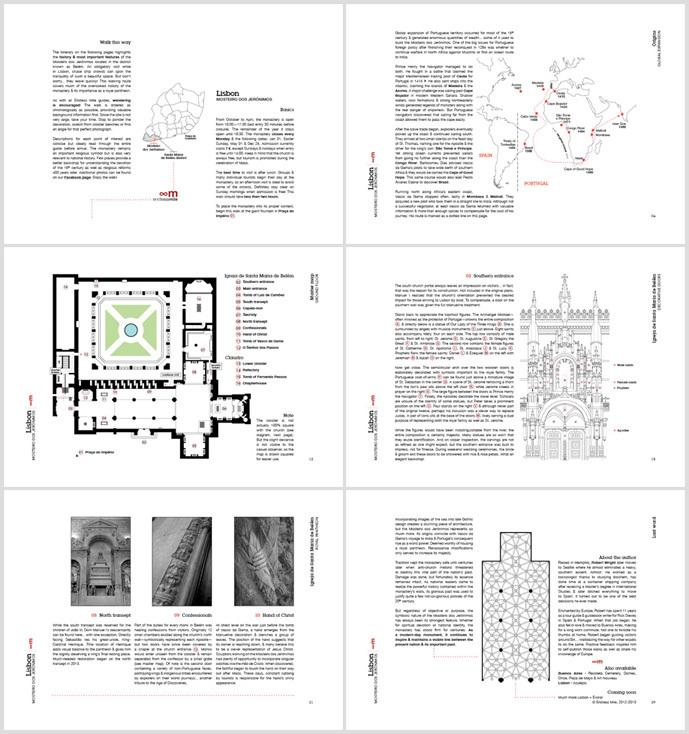 This blog post discusses the step-by-step process, from research to route development, map making & design… using this guide for the Mosteiro dos Jerónimos as an example. PDF format: A4 landscape, 30 pages. Ideal for viewing on any tablet or for print. Released Nov 2012, updated Jan 2018. This guide may not be redistributed, resold or reprinted. Duration: This visit should take less than two hours. Reading the history section before visiting is highly recommended. Not a problem. We’ve made our guide to DOMES OF BUENOS AIRES available for download free of charge! Although you’re thinking about Lisbon, this 12-page, map-based PDF (only 2 Mb) allows you to examine the general structure, layout & writing style of all Endless Mile guides. Plus, in the future you’ll have an opportunity to discover 75 great domes in Buenos Aires. Some features you’ll find are: a brief historical background, a summary of architectural styles & lots of original artwork. Take a look!